A finger-lickingly tasty, juicy and tender roast chicken that takes you to Turkey without having to travel. Additional spices, herbs and lemon are added to the marinade simply because they work well together and I love those flavours. 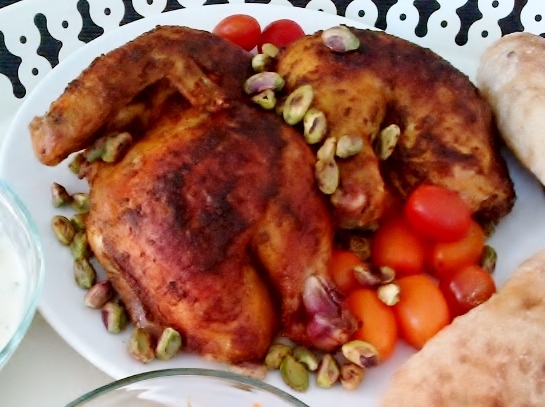 The chicken is garnished with roasted pistachios as they are my DCM’s favourite nut. Any olive of your choice works if you’re an olive lover like we are. Pita may be substituted for Turkish bread if you are unable to find any. Throw all ingredients into a zip lock bag or airtight container big enough for chicken and mix. Taste for seasoning and adjust to your liking. Add chicken to the marinade. Coat chicken well marinade. Leave in the fridge to marinate overnight or up to a week. Turn chicken occasionally. Take chicken out of the fridge, transfer to a roasting tray. Arrange the chicken so it is laid flat with the meat and skin side facing up. Place on the lowest rack in the oven. Set the oven to the conventional cooking setting ( ) at 200 degrees Celsius. This allows the chicken to warm up and the skin to dry while the oven is heating up at the same time. Dry skin = crispy skin. Once the oven is properly heated, start timer to roast chicken for 30-45 minutes. Your nose is your best indicatior of whether food is cooked. Once you can smell delicious aromas wafting from the kitchen, your food is more or less cooked. When chicken has turned slightly golden brown, switch the oven to the fan assisted grilling setting ( ) and turn the heat up to 250 degree Celsius. This renders the fat and crisps the skin. About 8 to 15 minutes. Turn off oven and remove chicken from the oven. Allow chicken to rest 10 to 15 minutes. If serving with shelled pistachios, scatter pistachios on a baking sheet and pop into the oven together with the chicken in its last 3 – 5 minutes of roasting. If they are not as done as you would like, just leave them in the oven after you have removed the chicken and turned off the oven. Be careful not to burn the pistachios. If serving with store-bought Turkish bread, pop bread into the switched-off oven to warm while chicken rests. I love marinating meats, especially chicken (chook). Marinades turn a normal piece of meat into something spectacular! If you just throw a chook into the oven with a little salt and pepper, olive oil; you get dinner. Put together a marinade of lemon juice, Dijon mustard, splash of white wine, trickle of honey, bit of melted butter and of course good ole S&P (salt and pepper), let a whole chook or your favourite chicken parts marinate in the marinade overnight to a week before you chuck it into the oven and you get dinner that makes you go “OMG… Mmmm…”. Yes it is more effort. But really, only slightly more. And the rewards are well worth it. I like putting together the marinade first so I may taste and tweak if necessary. Once done, that’s all the extra effort done. Since the apartment comes with a mediocre, tiny fridge (provided by the landlord), I am not able to store many things as the freezer portion is so limited. The solution is marinating. Marinades keep meats ‘fresh’ for longer in the chiller section through preservatives like salt, spices and oil. So, it was Deepavali and we were staying in. I wanted to make an indulgent yet healthy meal for my DCM. The Parentals recently went to Turkey on holiday and came back with Turkish goodies like apple tea, cheese, cold cuts, figs, honey comb, macadamia nuts, marinated green olives, olive oil infused with black pepper, pistachios, saffron and Turkish chicken spice rub. I’d marinated 3/4 of a fat chook in the Turkish spice rub and a few other ingredients, had organic baby carrots in the fridge and there were those green olives. A trip to Cold Storage (CS) at Great World City (GWC) provided me with all the other ingredients needed to whip up a Turkish-inspired meal. A week of marinating allowed the earthy, auburn spice mix to properly permeate the flesh while the lemon’s acidity acted as a tenderiser. I have a technique of oven roasting that always produces perfectly cooked chook (see recipe and cooking method here). The skin, always the most flavourful part, was crispy. The meat was so succulent that there was a pool of chicken juices at the bottom of the plate when we finished the meal. Yes, even the breast meat was juicy. The salad was fresh, crisp and sweet (see recipe here) while the yogurt sauce/dip was cool, refreshing and zingy (see recipe here). 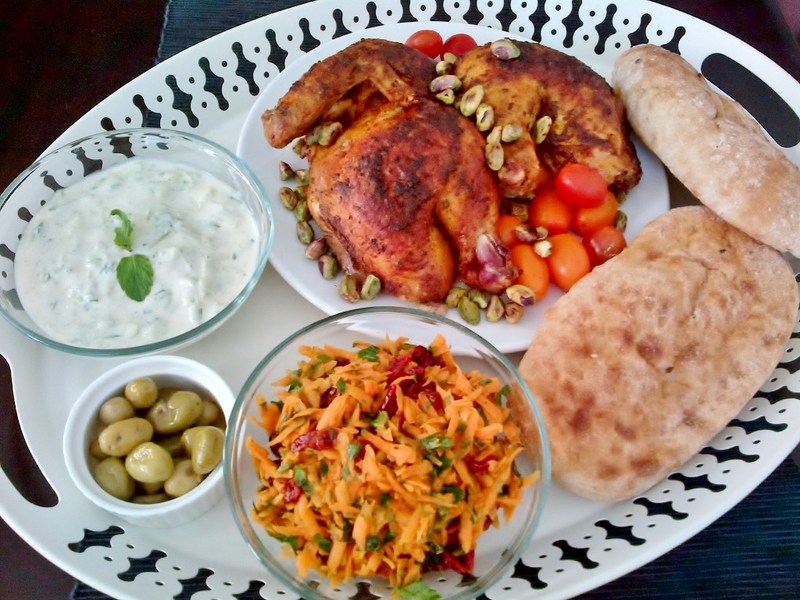 The yogurt sauce/dip cooled the spicy heat of the chicken and the sweetness of the salad balanced the sour tones present in the chicken and the sauce/dip. The Turkish bread I found at GWC’s CS was chewy, slightly dense and great as a vessel for the chook, salad and yogurt sauce’s trip to our mouths. It was delicious, messy and so satisfying. My DCM and I did not stop eating until everything on the tray disappeared.